This was a drinking fountain, not only for humans, but animals as well. Looking at the photo on the right, you’ll see five small holes on the side of the upper portion. This shows where spigots were once mounted. From these spigots (usually with a lion’s head design) poured a stream of water for humans to drink from. The water emptied into the large bowl which was for horses. At the bottom of the fountain water dripped into smaller bowls for shorter animals like dogs and cats. In the early 20th Century, Americans were increasingly concerned about improving living conditions for the country’s quickly growing cities. Public drinking fountains were not as common as they are today. The National Humane Alliance donated these fountains to cities all across the country. At one time, there was at least one in each state of the union. 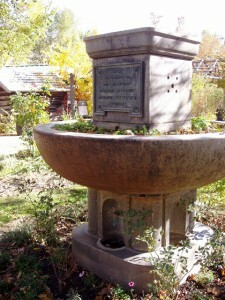 The fountain in Pioneer Village was originally located in Salt Lake City on the State Street side of Washington Square. It later became part of the original Pioneer Village collection when it was located in Salt Lake City. I have yet to find out when it was removed from Washington Square and how long it has been a part of the Pioneer Village collection. 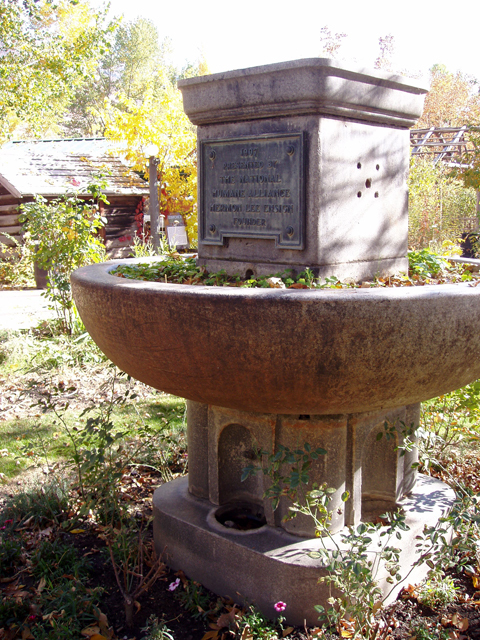 A website for the city of Derby, Connecticut features an extensive collection of photos of similar fountains in other cities as well as a list of original and current locations. New Fountain Typifying Humane Treatment Will Be Dedicated On Thanksgiving Day. The Salt Lake Tribune, 21 Nov 1907. Covotsos, Louis John, Mark M. Hopman, Merle Jacob and Carol Kaulfuss. The Illinois Humane Society: 1869 to 1979, Rosary College, Chicago. 1981. National Humane Alliance Fountains. ElectronicValley.org, 2 Jul 2010. A Watering Trough For Horses. ElectronicValley.org, 2 Jul 2010. I have sculpted bronze lion heads that would fit your fountain.